Birds, reptiles and small mammifers are abundant on the top of the mountain. Keeping in mind the rich and particular environment of the top insects should also be a particularly interesting group. 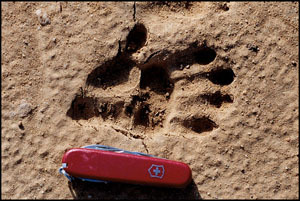 On the Mount Hombori a few mammals can be directly observed: among those the olive baboon (Papio hamadryas anubis ) and the rock hyrax (Procavia capensis). At the time of the first mission, we observed quite a lot of hyrax (photo) and we saw some traces of baboon (photo) we also brought an hyrax skull. 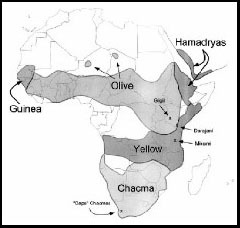 The olive baboon has a wide spread distribution from Middle Eastern to Middle Western Africa. 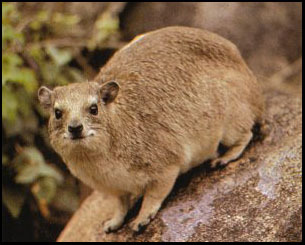 This species is found in a variety of habitat types from grassland steppe to tropical rainforests. The olive baboon is a frugivorous species, but leaves also constitute a major part of the diet. This species also eats flowers, roots, grasses, bark, twigs, sap, tubers, bulbs, mushrooms, lichens, aquatic plants, seeds, shoots, buds, invertebrates, and small vertebrates, such as gazelle. Females with infants mostly feed on the ground for grasses and on low bushes (Estes, 1991). Olive baboons will sit on the ground and shuffle along as they feed for grasses and other food found on the ground (Richard, 1985). Group sizes are variable ranging from 8 to 100 individuals. This is a diurnal species. The olive baboon will sleep in trees or on rocky outcroppings. In the next mission we hope to collect rodents and insectivores: principally gerbils, mouse and shrews. Our goal is to capture the giant shrew, Crocidura flavescens . Estes, R.D. 1991. The Behavior Guide to African Mammals . University of California Press. Richard, A.F. 1985. Primates in Nature . W.H. Freeman and Co., NY.